The NOMAD team has already been busy networking and engaging with industry since the project started in November 2015. A key element of our Industrial Outreach strategy is to seek and promote contact with interested decision makers to understand the strategic needs, habits, and expectations of the industrial sector. We want to identify what (incremental or disruptive) data tools could be strategic and have maximum benefit for industry. We’ve initially engaged with companies from a broad range of sectors, ranging from small and medium enterprises (SMEs) to large, multinational corporations. We regularly engage with our Industry Advisory Committee (IAC), which includes prominent representatives from SpringerMaterials, Haldor Topsøe, ONYX, QuantumWise, Dassault Systèmes BIOVIA, Fraunhofer, BP plc and BASF SE. They are also available for informal interactions between meetings, and provide a useful sounding board as we progress development of our tools and services. As we develop our tools, we are seeking industrial feedback in a number of arenas, from the appropriateness of our user interface and documentation, to reproducibility standards, and the robustness of our software tools for users operating in an industrial environment. 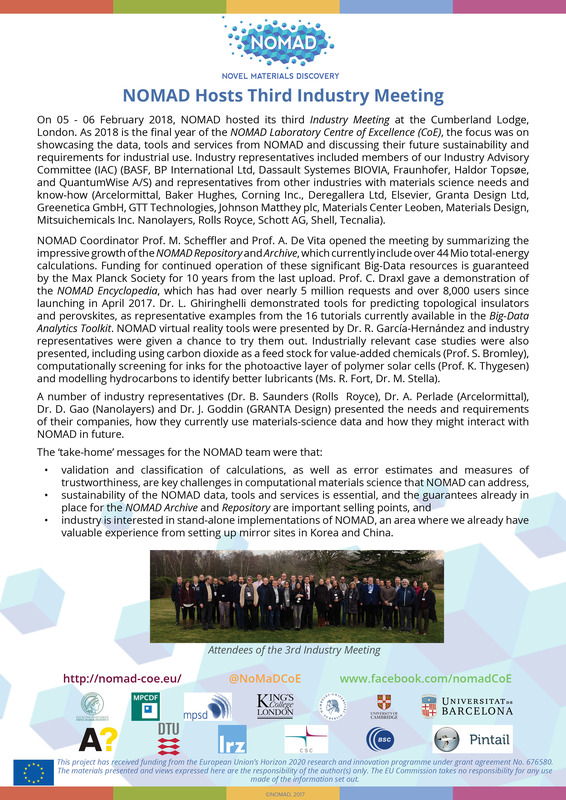 We have hosted three Industry Meetings (2016, 2017, 2018) to inform a variety of industries about the NOMAD Laboratory CoE and to learn what types of tools they would like to see developed. Our industry colleagues have provided us with feedback and valuable ideas on how to maximise our impact. You can read our reports on these meetings to learn more. We have also put together overview slides to introduce the project to industry users (Powerpoint, PDF) and Industry Reports on our activities. To gain a deeper understanding of what industry wants and needs from NOMAD, we conducted one-to-one interviews with industry representatives and we have initiated case studies. You can read summaries of the interviews and more about the case studies here.